The Pembrokeshire Sportive takes in some of the most beautiful little villages and roads that Pembrokeshire has to offer. 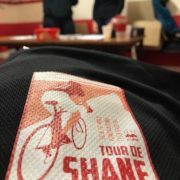 The county that boasts the fact that it’s the only Coastal National Park in the UK and many of the areas iconic coastal sites will be visited and passed as you take on the Tour De Shane. There are 2 distances of 50 miles and 70 miles.